Guwahati, April 28: Chung Kwang Tien, representative of Taipei economics and culture centre in India today said Taiwan is interested in sharing the country’s expertise in Bamboo commodities with Assam. “Taiwan, like Assam, is also closely associated with bamboo. Bamboo shoot is one of our primary ingredients in food and we have used bamboo charcoal for quite some time. Over the time, we have developed our technology in this field and have successfully produced various commdities. We are willing to use these expertises with Assam and form a trade relation here,” Tien told the participants in the Green Gold Bamboo Summit held at the Assam Administrative Staff College. Tien said that during his visit to Assam in March 2 this year, developing bamboo was one of the thre development plans he discussed with Assam Chief Minister Sarbananda Sonowal. “India Taiwan relation is more than 21 years old and we are not only committed to develop a relation with India but other states in the country too. We have 30 Taiwan companies investing in the Prime Minister Narendra Modi’s Make In India and we are eager to invest in bamboo sector in Assam,” Tien said. 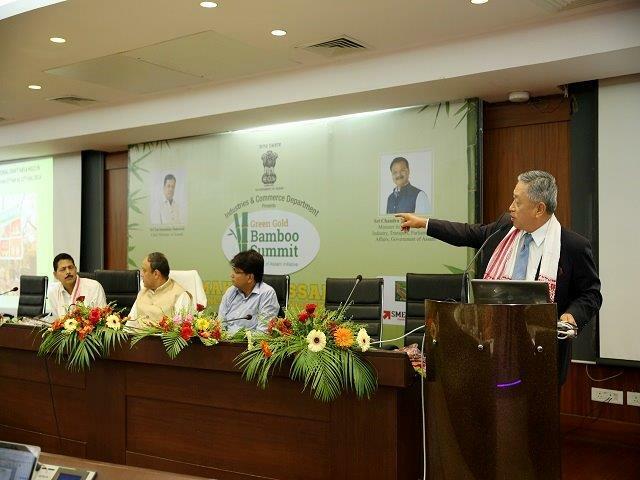 Assam additional chief secretary for industries and commerce, Ravi Capoor said the department is preparing a road-map to harness the bamboo resource in the state in collaboration with the state forest and agriculture department. “We have constituted an internal committee with the forest and agriculture department to find ways on how to we increase the productivity of bamboos and tap into it for commercial purpose. We have conducted survey in the forest areas of the state to find out the types, availability and quality of bamboo,” Capoor said. To promote the same, the Assam Industrial Development Corporation (AIDC) had promoted Bamboo Technology Park, set over a 60 acres land in Chaygaon, about 45 kms from here, back in 2010. Abhijit Baruah, one of the promoters of the park and member of AIDC, said, “The availability of commercially viable bamboo in the state is a big challenge. Also, procuring bamboo from places far from the place of production brings down the profit margin. So we are trying to reach out to 10-15 industries and form clusters of villages within a 15 km radius and educate the villagers regarding plantation”. According to S.S. Rao, state mission director (National Bamboo Mission) and principal chief conservator of forest (wildlife), 7200 sq km of forest land and 7900 sq km of non forest land within the state is covered by bamboo. “However, the actual quantity of bamboo that can be collected for harvesting can be said shortly,” Rao said.